Airframe design: a twin-engine, high-wing monoplane with a monococque fuselage made of plywood with retractable landing gear. Powerplant: two Junkers Jumo 211 F engines developing 1 340 HP each. All-up weight: 7 200 kg, range of 2 000 kg with a 500 kg bomb load. Design strength: N = 4 at 7 200 kg. Bomb load: 1 SC 250 bomb, or 1 SC 500 bomb, or 1 SD 1000 bomb. Armor protection: pilot’s seat and headrest (65 kg). Fuel and oil: self-sealing tanks with total capacity of 1 920 l placed in the fuselage. Two armored oil tanks in engine nacelles holding 80 l each. Radios: FuG 16 Z, FuG 25. All-up weight: 7 500 kg, range of 2 000 kg with a 500 kg bomb load. Design strength: N = 4 at 7 500 kg. Defensive armament: two fixed aft-firing MG 151 guns with 200 rounds of ammunition per gun. Fuel and oil: three self-sealing fuel tanks in the fuselage with total capacity of 1 400 l. Two armored engine oil tanks in engine nacelles holding 80 l each. GM 1 installation: an option to include two GM 1 tanks holding 160 l each allowing the continuous operation of the system for 30 minutes with a range of 1 500 km. All types of ordnance could be carried internally. Design strength: N = 4 at 7 450 kg. Armament: Two fixed forward-firing MK 103 cannons, Two fixed forward-firing MG 151 cannons. Fuel and oil: self-sealing tanks with total capacity of 1 850 l placed in the fuselage. Two armored engine oil tanks in engine nacelles holding 80 l each. Radios: FuG 17, Peil G VI, FuBl 2 F, FuNG 101, FuG 25a, FuG 28a, FuG 212. In the meantime German air defenses had a very difficult time trying to intercept the RAF Mosquitoes. The incoming British aircraft had to be picked up by radar before their position could be relayed to the closest night fighter unit. By the time the alert aircraft were scrambled and climbed to the Mosquito’s operating ceiling any hope for a successful intercept had been all but gone. Knocking down a Mosquito thus became a simple matter of luck. It was painfully clear that the only way to counter the threat was to develop an aircraft that could outperform its British counterpart. – flight test program must commence no later than 12 months after the orders have been placed. Kurt Tank’s “Entwurf 2” seemed to fit the RLM’s specification quite closely. To pay tribute to the chief designer the proposed aircraft would also receive the “Ta” designation in place of the customary “Fw” prefix used in other Focke-Wulf designs. The RLM’s standard practice was to assign a numerical designation to each new design. Fixed wing aircraft were assigned number 8 followed after a dash by a three-digit group. The original RLM designation for “Entwurf 2” was 8-211. The aircraft engines were all assigned number 9, so Junkers powerplant intended for the new aircraft was designated 9-211. The similarity of the designations of the aircraft and its powerplants could lead to mistakes in documentation or in the procurement of spare parts. Tank received designations 152, 153 and 154 for his aircraft. 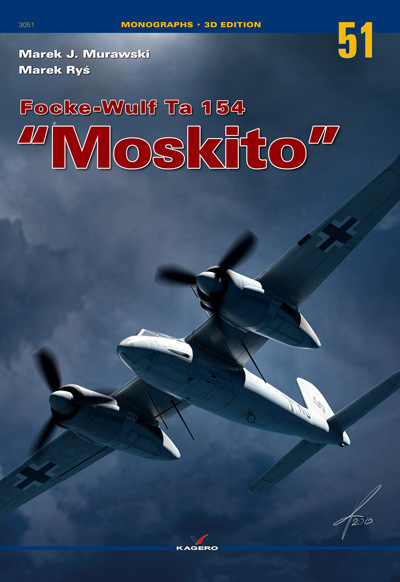 Numbers 152 and 153 had already been reserved for the development versions of his Fw 190 series fighters, so the original Focke-Wulf designation of the “Entwurf 2” – Ta 211 – was changed to Ta 154. Airframe design: a twin-engine, high-wing monoplane with a monococque fuselage made of plywood with retractable, tricycle landing gear. Design strength: N = 5.5 at 8 250 kg. Armament: Two fixed forward-firing MK 108z cannons with 110 rounds of ammunition, two fixed fuselage-mounted MG 151 weapons with 250 rounds of ammunition, one MK 108 cannon with 150 rounds mounted in the fuselage at a 45° angle. Armor protection: 150 kg of armor plating around the forward cockpit area. Fuel and oil: two self-sealing tanks with total capacity of 1 600 l placed in the fuselage. Two armored engine oil tanks in engine nacelles holding 70 l each. Radios: FuG 17e, Peil G VI, FuBl 2 F, FuNG 101, FuG 25a, FuG 28a, FuG 212. Tank’s proposal for the use of plywood and solid wood in the construction of the airframe sat well with the decision-makers at the RLM. Experts at the Technisches Amt understood very well that the front-line night fighter types in service with the Luftwaffe (Bf 110s and Ju 88s) had been approaching the limits of their development potential and would have to be replaced with a new generation fighter. Tank’s design seemed to fit the bill not only because it would be manufactured using non-strategic materials, but also because its projected performance figures looked impressive. As early as mid October 1942 Milch issued orders to discontinue the development of the fast bomber version and to focus on the design of the all-weather night fighter aircraft powered by Junkers Jumo 211 engines. The Focke-Wulf plant was supposed to receive orders for the production of the initial batch of 50 aircraft of the new type. The Luftwaffe’s commander, Reichsmarschall Hermann Göring, gave the project a green light on October 20, 1942 and three days later the official document containing design characteristics of the Ta 211 night fighter was filed with the RLM. Following Milch’s orders of October 30, 1942 the task to manufacture and test the new fighter went to Focke-Wulf’s plant at Langenhagen near Hannover. On November 13, 1942 Technisches Amt officially changed the project’s designation to Ta 154 and placed an order for the construction of ten prototype machines (Ta 154 V1 to Ta 154 V10). On January 18, 1943 the key personnel were summoned to Berlin to review the progress of the Ta 154 project. One of the issues discussed in the meeting was the difficulties in sourcing specialists with experience in application of wood in aircraft manufacturing. The obvious choice would have been skilled workers employed in the production of World War I aircraft, but even those were hard to find since in most cases they had been drafted into active service. Another problem was the Ta 154’s proposed powerplants. It became obvious that in the long run the Jumo 211 engines would need to be replaced with more powerful units. To make matters worse, it appeared that the use of flame dampers and the installation of FuG 212 aerials would reduce the aircraft’s top speed by some 35 to 45 km/h. The Jumo 213 engine, the most promising alternative to the 211, was still undergoing tests and by the looks of things was not going to go into full-scale production any time soon. Milch, who viewed the Ta 154 project as a stop-gap measure before the introduction of the He 219 night fighter, did not exactly help when he demanded that Tank’s machine should be armed with four MK 103 cannons, which would necessitate a complete re-design of the aircraft’s fuselage. The troubles did not end there. In June 1943 Focke-Wulf management received the requirements of chiefs of different Luftwaffe commands. It was the wish of the General der Jagdflieger (inspector general of the fighter command) that all Ta 154s should be equipped with the GM-1 installation. The General der Kampfflieger (inspector general of the bomber command) wanted bomb bays to make the Ta 154 a close match for the British Mosquito, while the General der Aufklärungsflieger (inspector general of reconnaissance command) thought the Ta 154 would make an ideal reconnaissance platform. The threat to German aircraft industry posed by Allied (mainly American) bombings resulted in orders to disperse the production of the Ta 154 and to make a wider use of a network of subcontractors. As a result three production areas were established: Fertigungskreis Schlesien (Silesian production area) tasked with the production of the Ta 154 A-2 (single-seat day fighter), B-1 (two-seat night fighting version) and C-1 (another two-seat night fighter variant); Fertigungskreis Thüringen (Thuringia production area) would see the production of the A-1 machines (two-seat day fighter version), A-2, B-1, B-2 (single-seat day fighter) and the C-4 (two seat day fighter-bomber); the A-1, A-2, B-1, B-2 and C-4 models would be assembled in Fertigungskreis Warthegau (Warthe District production area). Some of the preliminary work included stress testing of the aircraft’s fuselage, since it was especially vulnerable to high loads because of the weight of internally mounted armament and radio gear. To this end a mock-up of the Ta 154 fuselage underwent a series of underwater tests at Graf Zeppelin test site at lake Alatsee near Füssen. The tests that began in December 1942 included the towing of the instrumented fuselage section behind a speedboat to establish the actual strength of the design.